Padar Island is the third largest island in the Komodo National Park, after the Komodo and Rinca Islands. Perhaps the existence of Padar was not as famous Komodo or Rinca, Padar Island beauty but no less beautiful with both Islands. Location of Padar tends to be closer to Rinca Island compared to the distance to Komodo Island and is separated by Selat Lintah. Padar is also accepted as a UNESCO World Heritage Site, because it is in the Komodo National Park, along with the island of Komodo, Rinca and Gili Motang. 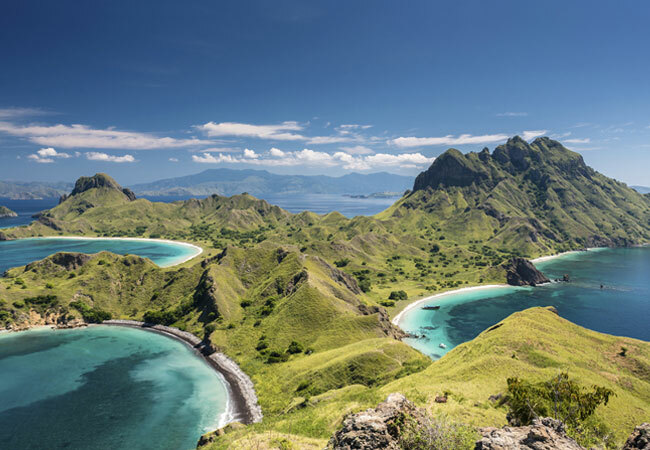 Although being in the Komodo National Park, Padar but not inhabited by dragons, because of disconnected food chain. From Labuan Bajo, Padar island can be reached by a traditional wooden boat about 3 hours. In the top of Padar presents a beautiful landscape with 3 beaches. To reach the top, tourists have to walk approximately 1 hour. It was indeed quite tiring, but once arrived at the top, the fatigue is gone replaced with admiration watched the beautiful panorama. All around of this island, there is three or four small island with a unique panorama of each. Padar Island also includes overlay pink beach that is suitable for a swim, play water or snorkeling with the beautiful underwater view. Many domestic and foreign tourists visit Padar, including Valentino Rossi. The Italian rider making a scene in the virtual world traveler. He was caught on camera when arriving at the Labuan Bajo Airport and is touted to come there for a holiday in Komodo and surroundings. If you are planning to visit the Komodo National Park, try to stop for a moment on this island, quietness and beauty will make you comfortable to linger on this island.